Peabody Properties, Inc. | Unity Day! On October 21, 2015 in honor of nationally-recognized Unity Day, residents and staff of Braintree Village Apartments united to support safe schools and communities against bullying. Joining Braintree Village participants to deliver a message of acceptance and inclusion were Frank Hackett, Braintree Public Schools Superintendent; Christopher Griffin, Assistant to Mayor Joseph Sullivan; Chief Russell Jenkins and Officer James Mosesso, Braintree Police Department. Participants sported orange, the official color of Unity Day. 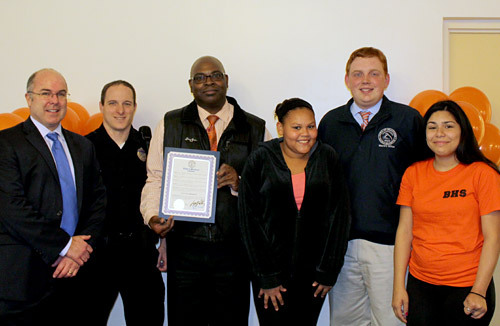 Pictured (left to right): Frank Hackett, Braintree Public School Superintendent; Officer James Mosesso, Braintree Police Department; Alan Rias, Resident Service Coordinator at Braintree Village; Zahkya Campbell, Braintree Village Resident; Christopher Griffin, Assistant to the Mayor and Briana Harris, Braintree Village Resident. The New England Affordable Housing Management Association Honors Peabody Properties Team With Top AwardsPeabody Properties Receives 3 Top Honors For Housing Excellence!